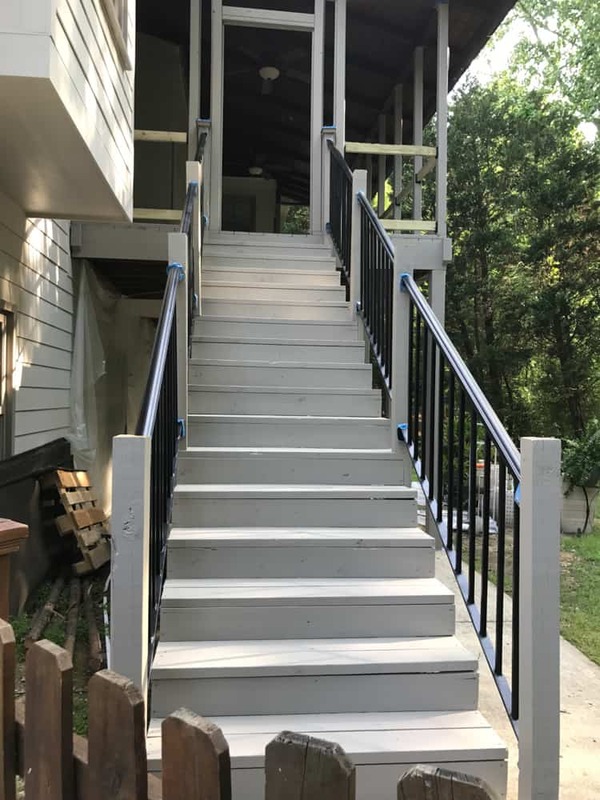 Along with the many outdoor projects we needed to tackle at #theTrailHouseReno, the back porch and stairs needed some attention. 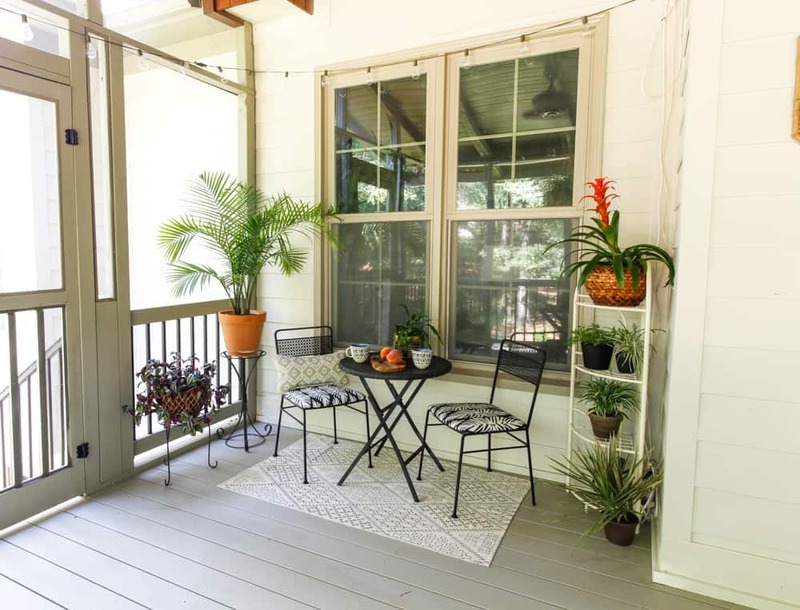 The porch stain was too dark for the new lighter exterior and I knew that the look of a painted porch was what I desired. The stairs were rebuilt this spring with new wood because the old stairs had rotted and lacked the proper foundation. Once the pressure treated wood had dried it was time to consider how to marry the new stairs to the old porch. 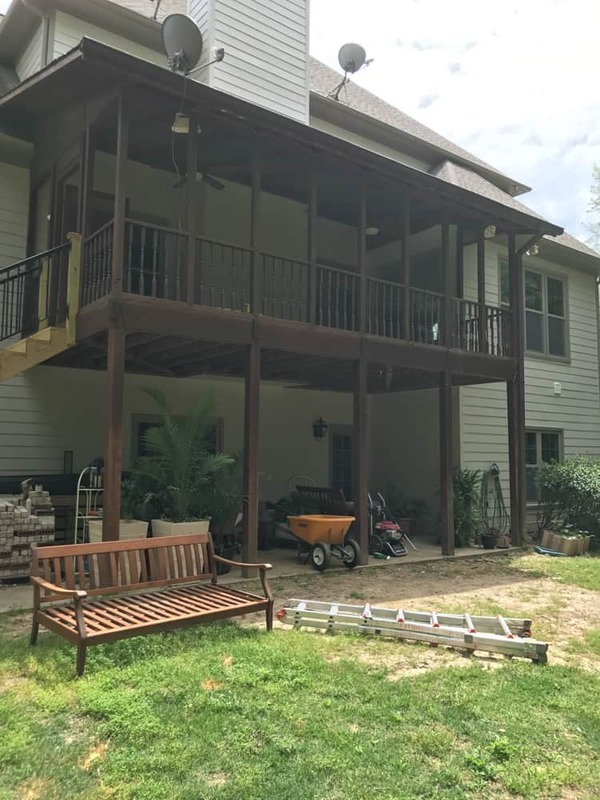 The likelihood of any transparent or semi-transparent stain matching the old, red cedar wood and stain was zero and of course, I wanted a lighter color and the look of a painted porch. 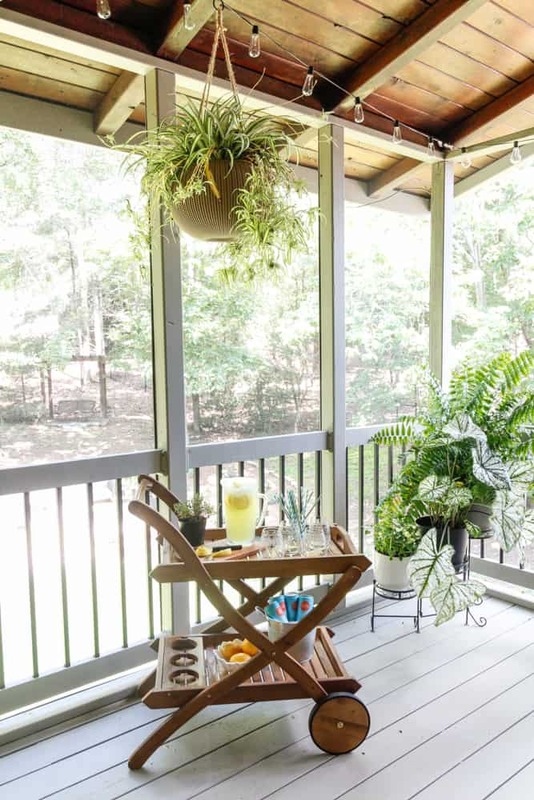 But here’s the thing, you really don’t want to use “paint” on a wooden porch or deck. The product that will offer the most durability for the harsh conditions of sun, rain, heat, cold and most importantly, foot traffic, is a solid stain. The properties of a stain, even an acrylic based product like the one I used, actually bind to the wood instead of just floating on its surface. 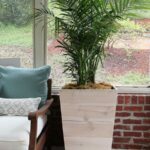 A high-quality solid stain offers paint-like coverage but allows the moisture of the wood to escape and the wood to expand and contract as it does naturally, without cracking and peeling the way paint does. I was gifted product for review from Rainbow Paint and Decorating. All opinions, suggestions and photos are my own. After doing a great deal of research and visiting my local Rainbow Paint and Decorating Store, I found an excellent product, RIDGE LINE Solid Acrylic Stain, that far exceeds many others in the marketplace. I won’t go too deep into the technical details that make this product better here. 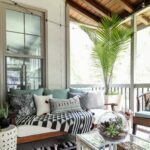 But what I can easily tell you is that, due to recent government regulations and guidelines, the giant distributors of outdoor finishes have been forced to adjust their formulas. Sadly for consumers, these regulations have given companies no option other than to produce an inferior product. 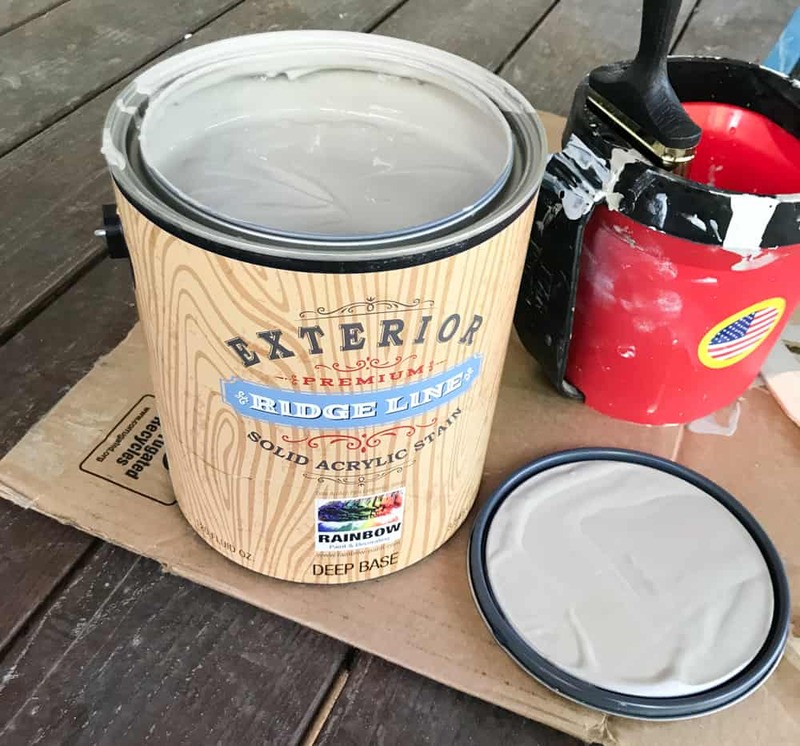 RIDGE LINE is sold exclusively at Rainbow Paint and Decorating and produced by a smaller manufacturer of quality paint and finishes, Richard’s Paint. They offer superior products for independent paint stores, affirming the adage that “buying local is best.” If you are not local to Birmingham, Alabama here is a link to find a local distributor in your area. 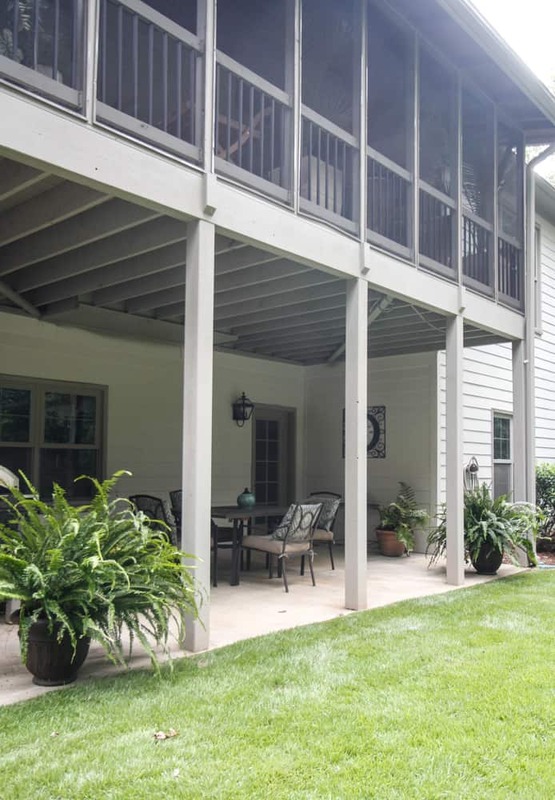 Any good DIY site will tell you that the key to proper deck or porch staining is preparation. 1. 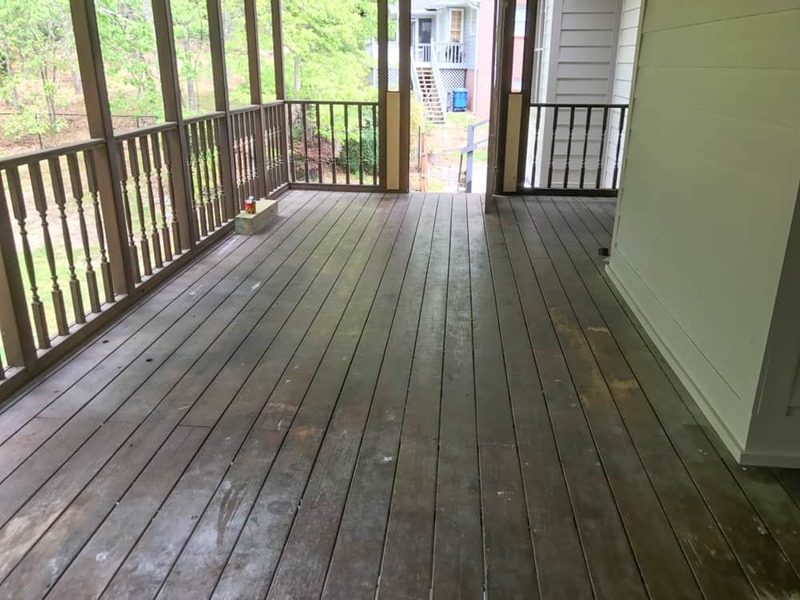 Start by pressure washing all of the wood surfaces to be stained. 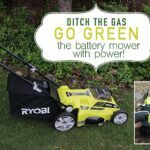 It is recommended to use a pressure between and 500-1200 psi at a distance of 9 -12 inches from the deck. 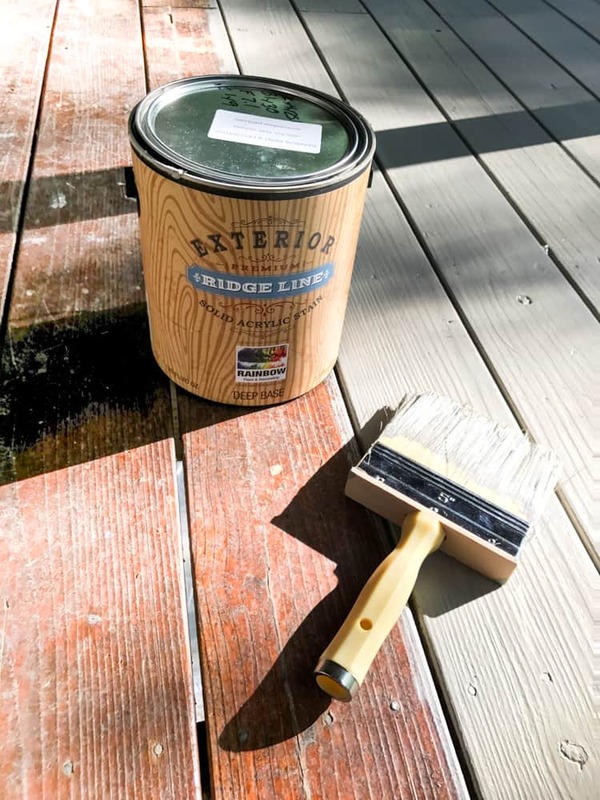 If the current old finish is peeling or cracking consider using a deck stain stripper and follow the instructions on the label. 2. 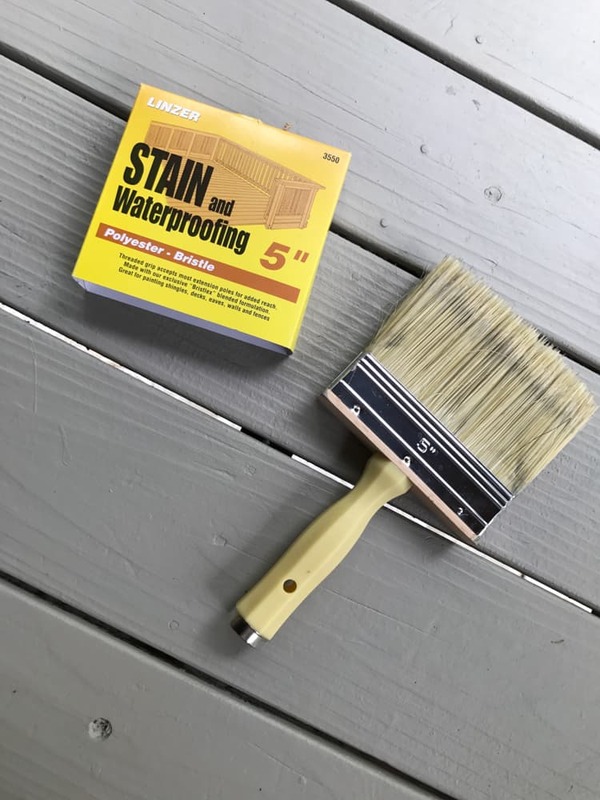 After pressure washing and the wood has dried for at least 24 hours, it is best to sand the floor boards with sandpaper to ensure proper adhesion of the stain. This also gives you a perfectly smooth surface for walking. 3. Clean the dust and debris. 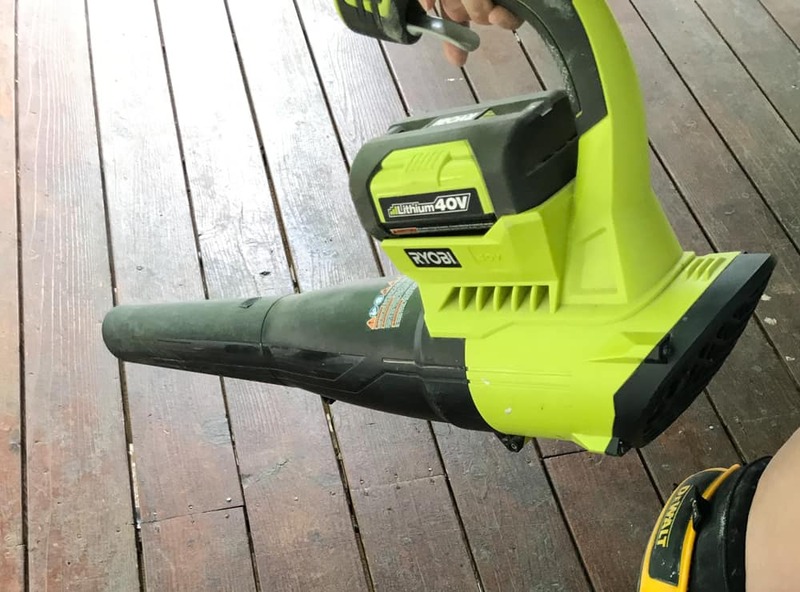 I always use a blower for cleaning up sawdust. 4. The solid stain is most effectively applied with a brush. You will achieve the best coverage and bonding with a brush. A large, 5″ brush makes quick work of the project. I would also recommend a pair of high-quality knee pads for a job like these. They are definitely worth every penny! 5. Be mindful of the best place to start and stop. I began with the posts and then the floor on the far side of the porch first. I knew it would rain later in the week and I wanted this area to have time to dry before the rain came. Unlike many other stains I have used in the past this product is extremely thick and spreads beautifully. The thickness prevents a sloppy, drippy mess below, which I loved. It also provides excellent coverage. 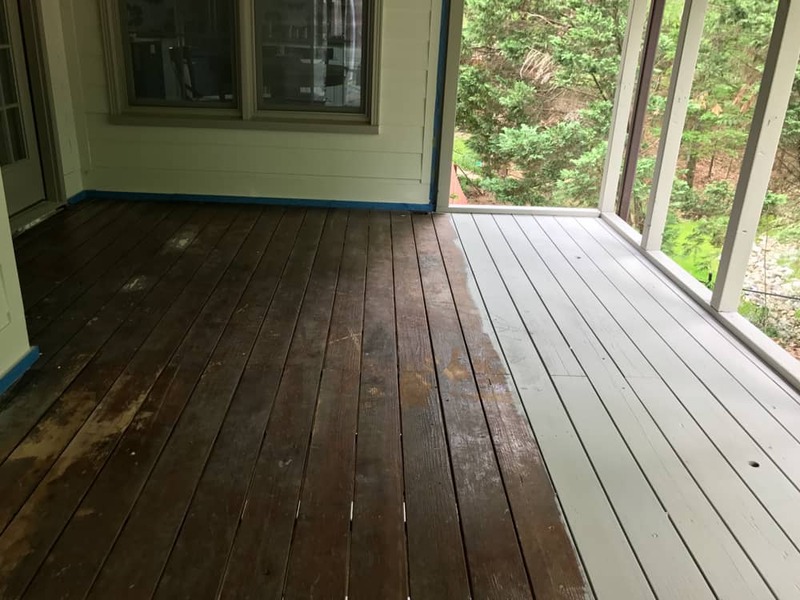 The one caveat about our specific project is that our deck probably should have been pressure washed with a little more pressure to remove more of the color. (See step 1) Even despite that issue, the durability of the RIDGE LINE Stain has been fantastic. Then I “painted” the sections by the door and close to the house. Lastly, I stained the area in the middle and then began making my way down the stairs. 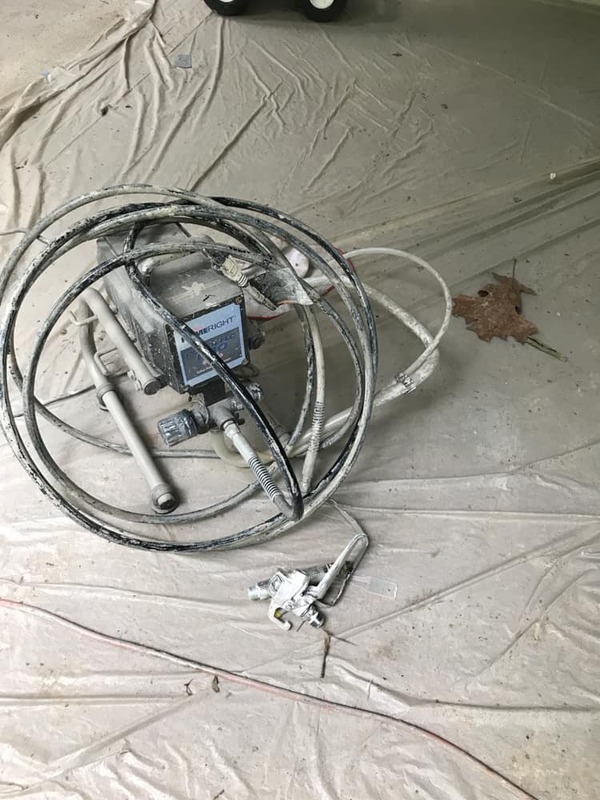 Under the porch, I used a sprayer, despite the manufacturer’s recommendations against that. This application was for aesthetic purposes only. The reduction in durability I was warned against with a spray application was much less of an issue. While this was indeed a big project, it was one that could easily be tackled as probably a two weekend DIY. 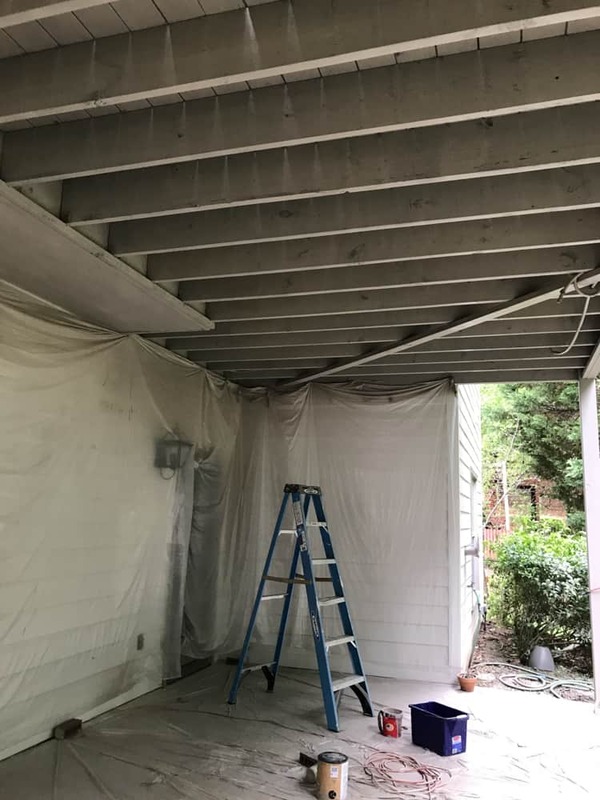 I worked on all of the surfaces that didn’t require being high on a ladder, and the underside of the porch. My husband climbed on the new railings and hung off the ladder. It made me weak in the knees just to watch him, but he was a champ! And because everyone loves a good before and after. 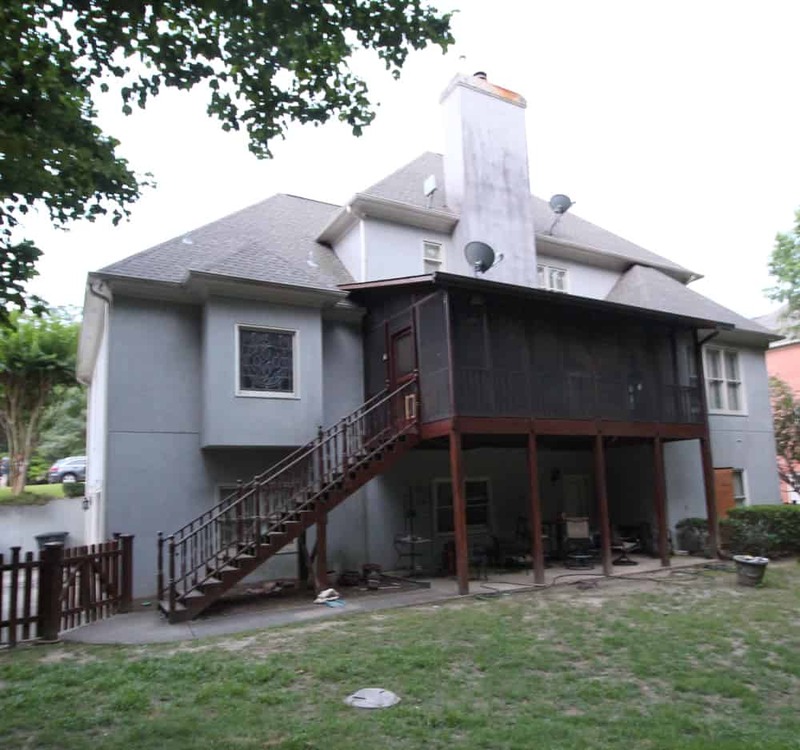 Here’s a look at what the back of the house looked like when we purchased it. 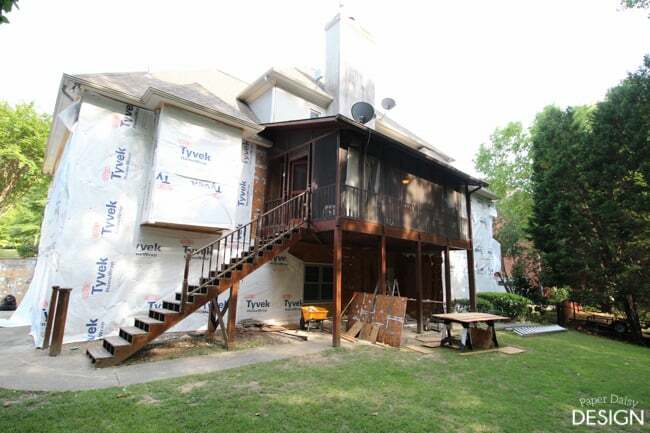 Here is what the house looked like during the removal of Dryvet and prep for new siding. And a year later, the back of the house is finally complete! Eventually, we will repair the fence and stain it. We also plan to add an outdoor kitchen and build a giant table out of the reclaimed wooden stair treads. Then, this area will be more than ready for outdoor entertaining. But even now, the area under the porch is so much brighter and more inviting. 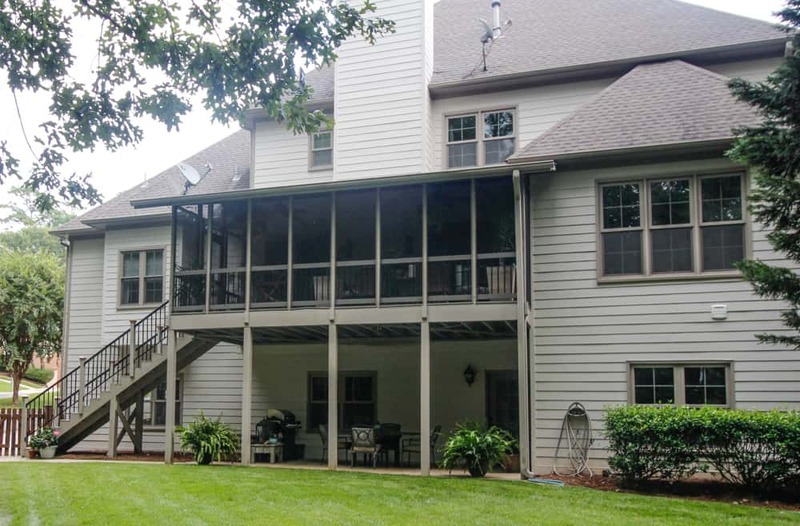 With the addition of a couple ceiling fans, we can certainly make use of the area this fall. And can I tell you how happy I am to have grass right off of the patio? I am extremely happy! 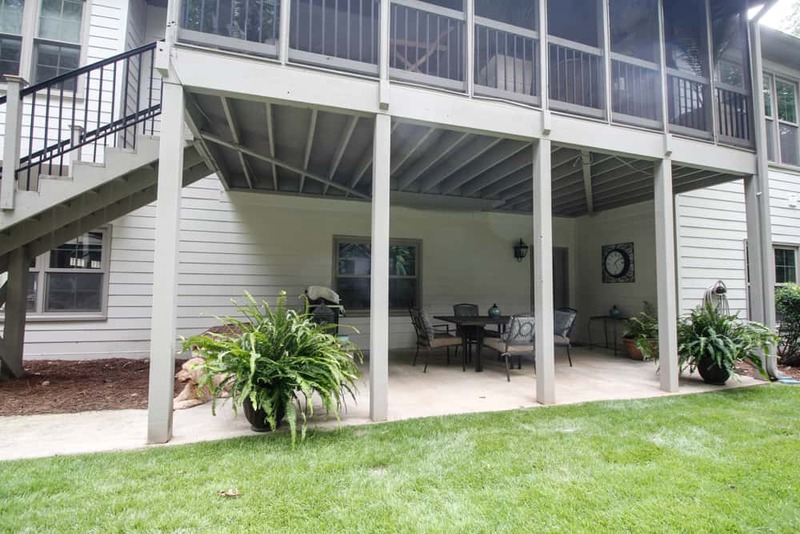 Did you see what the inside of the porch looks like? 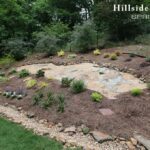 Check out the complete reveal by clicking HERE. 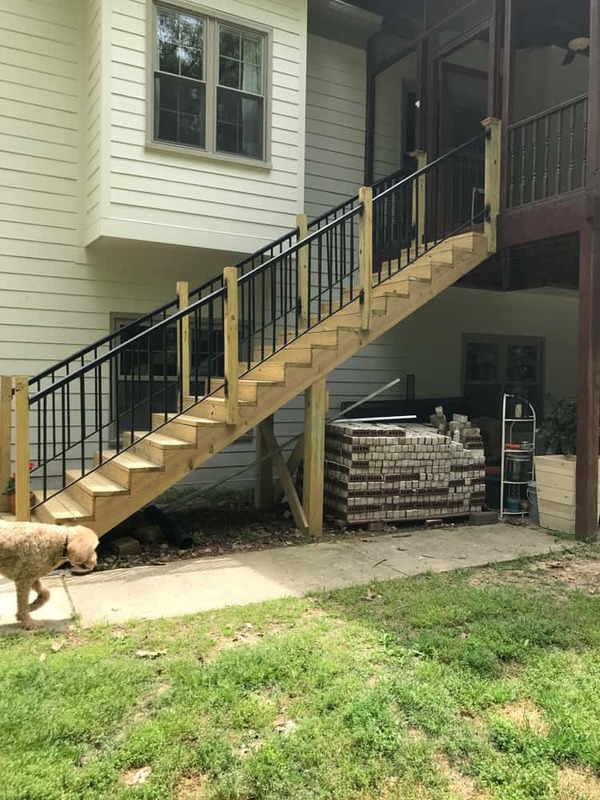 Want to know how we rebuilt the porch railings. It was much easier than I thought it would be. 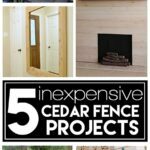 I think you’ll be pretty impressed and if you need new railing you won’t want to miss it! Read more here. Subscribe to my newsletter here to not miss a new post or follow me on Instagram and Facebook.